, with no doubt Graphene Tech had to attend this European Conference on thermally and electrically Conductive Polymers and composites held in Alessandria, Italy form 8 to 10 November 2016. Almost one hundred participants from all over Europe were present, mainly from Italy, Germany and Spain, participating actively in the bilateral meetings and keynote speeches. 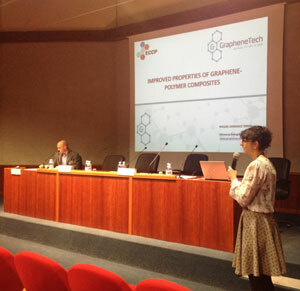 Our Science Advisor, Raquel González was there proposing her conference focused on the synthesis and the application of graphene for the polymer sector, mentioning the level of progress achieved in EEA Graphene-Tech. The three-day event showed us that industry, science and professionals are all struggling to find out innovative solutions in the conductive polymers area due to the fact that Plastics Industry touches every market, every region of the world.